People love munching on popcorn while watching movies, whether in movie theaters or in the comfort of their homes. It is not only delicious but is a healthy snack as well. Popcorn contains protein, iron, calcium, and is also rich in insoluble fiber, making it good for the digestive system. 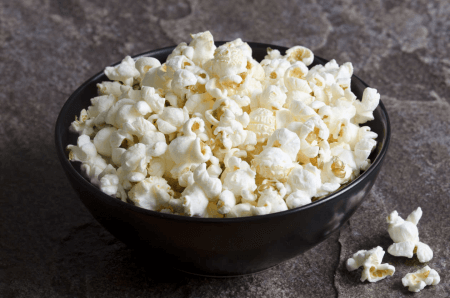 This light and fluffy snack comes in different varieties but the most common types are white popcorn and yellow popcorn. 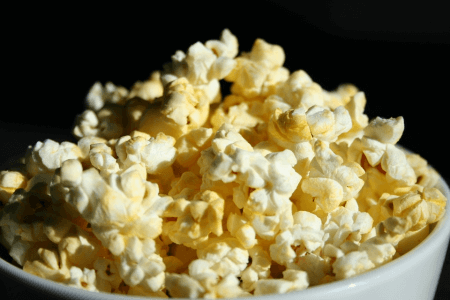 In this article, we’ll tell you more about these two types of popcorn and their differences. White popcorn comes from small kernels. It is also called rice popcorn since the kernels look quite like rice granules. When it pops, the resulting soft, slightly crunchy, white goodness is 40 times its kernel size and has a mushroom-like appearance. This type of popcorn is usually eaten with a little salt or butter. Some people add small amounts of flavoring but it still mostly retains its original white color and flavor. There are those who prefer this type of popcorn over other varieties and consider it to be the healthiest type of popcorn. Yellow popcorn comes from medium to large kernels. The kernels of yellow popcorn look similar to pearls. Once it is popped, it grows to 46 times its original size. Yellow popcorn appears really fluffy, likened to the shape of butterflies or snowflakes. This type of popcorn is usually served with lots of butter and other flavorings, enhancing its yellow appearance. Due to the added fat and artificial flavors, some people would consider this to be a less healthy snack. Nevertheless, yellow popcorn is known to be a good source of vitamin A as it contains carotene, which is the source of its yellow color. What is the difference between white popcorn and yellow popcorn? White popcorn is white while yellow popcorn has a soft yellow hue. Smaller, thinner, rice granule-shaped kernels are characteristic of white popcorn whereas yellow popcorn has medium to large kernels which resemble the shape of pearls. Once popped, white popcorn becomes 40 times its original size and takes on a mushroom-like form. Yellow popcorn, on the other hand, pops to 46 times its kernel size and has a snowflake or butterfly-like appearance. White popcorn typically has lower fat and sodium content compared to yellow popcorn because of the higher amount of butter or flavorings typically added to it.